The @Work Experience measure is a 10-minute survey assessing the employee work experience associated with the @Work Experience Framework dimensions. The measure has now been iterated with over 1000 professionals world wide. Look for our upcoming white paper and publications to learn more. 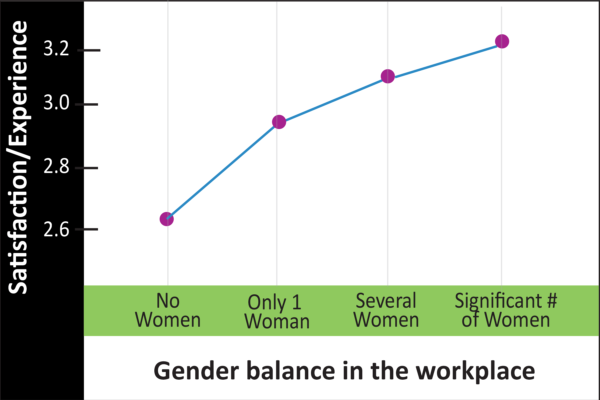 Both men and women score higher on key factors if they have more than one women on their team. In spite of many initiatives to attract and retain women in technology, the numbers are sobering. Central to attrition is the mismatch between the expectations and needs of women and workplace realities in technology companies. The @Work Experience Measure helps companies understand how they are doing on the key dimensions of employees’ daily work experience. Work with us to see how you are doing and improve your problem areas. Employees “Thinking of leaving my job” have significantly lower scores on key factors. The @Work Experience Measure was developed by using our qualitative data to stimulate the generation of questions. The measure covers the @Work Experience factors and several additional areas such as gender interactions. Our subsequent analysis has shown that the dimensions can reliably differentiate the experiential quality of different work environments in technology firms. Volunteer Opportunity: We are looking for companies to volunteer to try the measure on several hundred tech employees with different job titles on different team. This will help us learn how the assessment may work within and across companies. Please sign up to help. Collaborating Colleagues: Thanks to Carol Farnsworth, Andreas Paepcke, and Nicola Marsden for their work on the survey. Thanks to the directors of the HCI masters programs for help findingn participants at University of Maryland, Georgia Tech, and CMU. Donate: to the survey fund. We need $20,000. to run another panel and analyze the data.